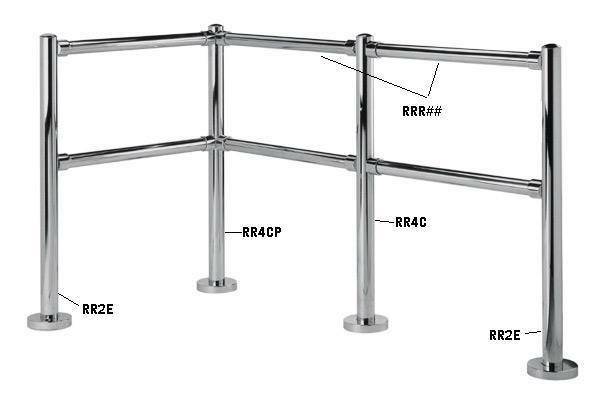 Chrome Railings - Chrome Rails | Carriage Trade Service Co. Product Description We offer a complete line of post and railing components. Designed for strength, durability and aesthetic appeal, these chrome railing systems afford directional crowd control and security in addition to use in a wide variety of custom applications. Our posts feature a steel base plate welded to heavy duty steel tube with a secure post cap. There is no exposed anchoring. The rail outlets bolt directly to the post and a 0.25" set screw securely lock the rail into position. Railing lengths are 1.75" O.D. Horizontal rails 19.75" and 33.75" on center from floor. Materials: All tubing meets appropriate ASTM standards. Finishes · Available standard in highly polished chrome. Installation Posts are designed to be mounted to a firm foundation. The mounting hardware (anchors, bolts, washers, etc.) to mount the unit to a concrete or Terrazzo floor is available (additional charge may apply). It is suggested to use skilled mechanics either under the supervision of a Manufacturer’s representative, or following the manufacturer’s directions and instructions (supplied with the gate).